In the battle of simplicity vs. complexity, simplicity wins, every time. We gravitate toward products and services that eliminate complexity from our lives, and we rail against the things that complicate matters and make us feel stupid. Back in the days of the three-martini lunch, golf instruction was simple and appealing. As a country club member you had a pro at your disposal. He’d work with you on the driving range, play with you, coach you to get better, and monitor your progress. It was a personalized, one-on-one experience. No two lessons were the same. 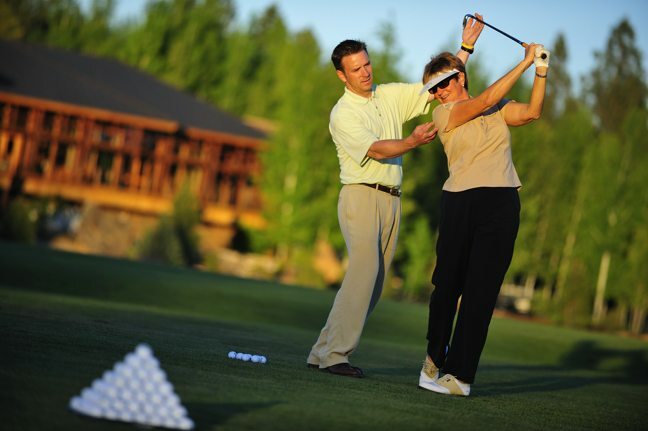 He worked with the swing you had, and helped you build the skills you needed to score well on the golf course. Accountability was built in… You’d practice because you knew the pro was keeping an eye on your progress. Because most lessons are totally intimidating, especially for women. Because most instructors make them way too complex! And most of all, because they frequently don’t work. Often it’s a checklist of a dozen mechanical issues that the average guy can’t possibly grasp, much less incorporate into his game. The more technical the lesson is, the worse it gets. Video analysis only helps the most analytical, visual learners; Maybe one half of one percent of the golfing population. And yet, instructors routinely use stop motion video to analyze every position and point out every flaw. More often than not, it’s just confusing and demoralizing for the student. Rather than working with the student’s natural swing, today’s teachers tell everyone to emulate Tiger or some other tour player. They bottom line is that if the golf industry is going to turn things around, the methods of instruction HAVE to change. We’ve got to make it simple, enjoyable and fun. If you like what I write about I would love more likes on Facebook at https://www.facebook.com/racingdonkey. Also leave comments about what you would like to see. Also check out my websites www.Essentiallygolf.com and www.Racingdonkey.com. There are plenty tips and info on the blog and video pages. Check out our store on either site for all your golf needs. I have spent most of my childhood and adult life in golf and I developed a love and respect for the game at a very early age.I was extremely fortunate to have wonderful teachers work with me throughout my career and never charged me a dime.In return for that I have probably given away more lessons than I have ever charged for.I just love helping people enjoy golf more. Posted in Marketing for Golf Courses, Sam Adams and tagged Facebook, Golf Digest, Golf Instruction, Golfers, Jim Flick, NGF, Phil Mickelson, Tiger.